ADJUSTABLE DESIGNED: Both the tactical vest jacket and hand wrist band suit most 5+ year-old children because of the adjustable Velcro designed. We provide perfect after-sale service for each customer, hassle-free shopping. PROTECTIVE YOUR KIDS LIKE MINE: The vision goggles protect your child's eyes, the cool tactical mask protect kid's face. They also make your kids look much cooler in the Nerf game, increasing the chances of victory. HIGH QUALITY: The elite tactical vest, wrist band and mask are made of non-toxic and breathable fabric, durable and safe to use, easy to wash and dry. A wise choice of military tactical vest set! 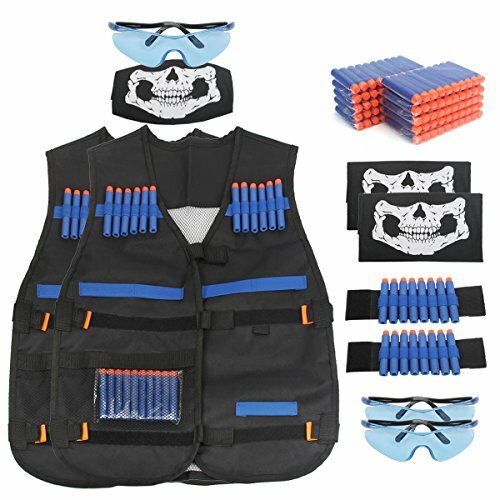 COMPATIBLE WITH NERF GUN: Including 2 x tactical vest, 2 x wrist band, 2 x goggle, 100pcs x foam darts. The darts work for most N-Strike Elite blaster guns, such as elite spanker, Modulus, Zombie strike, Rebelle, ect. Best gift for boys and girls.